Experience the science of silence with Provent Therapy! Provent Therapy is a simple, effective and non-invasive treatment for Obstructive Sleep Apnea (OSA). Provent® Sleep Apnea Therapy is a disposable nightly-use nasal device. Provent disposable patches fit comfortably over the nostrils and is secured in place with hypo-allergic adhesive. Because Provent Therapy is a small, single use, disposable device, it’s also discreet and very convenient. Ideal for use at home or while traveling (many customers who wear CPAP masks at home use Provent when they travel). They offer a great alternative for people who can’t fit a bulky CPAP machine in their bedroom, or those whose snoring or sleep apnoea doesn’t require such an intense treatment. 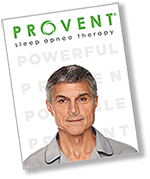 Provent is primarily intended for those with Mild or Moderate Obstructive Sleep Apnea (OSA), who have tried other treatments (e.g. CPAP, medication or dental split) and are finding it difficult to maintain compliance (i.e regular use). In terms of effectiveness CPAP remains "gold standard " - but if you are unable to use it every night, then Provent is available as an alternative treatment option and is effective in treating both Obstructive Sleep Apnea (OSA) and snoring. However, if you are not suffering from OSA, but do struggle with snoring, then Theravent Snore Therapy may be the solution for you. The Starter kit is intended for those looking to use Provent for the first time. If you already use Provent, then you can find the regular packs here. Please consult with your physician before using Provent Therapy for sleep apnoea. Proven effective to decrease apneas (breathing pause), reduce daytime sleepiness, improve quality of sleep and reduce snoring. Discrete, small and disposable, ideal for travel- No more mask, CPAP or humidifier taking up space in your luggage! This 30 Night Starter Kit is designed to help new users become acclimated to Provent by gradually increasing resistance over the first several nights of therapy. Each pouch contains two valves (one Provent Nasal Device) intended to be used together for one night’s use and should be stored in a cool, dry place. 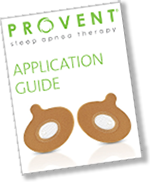 Provent is just one of the products that HomeMed offers as a solution to snoring and sleep apnoea. We are committed to sourcing products that help people lead a higher quality of life through better sleep. Sleep is a vital human function; it is when you body is resetting and replenishing, arranging your thoughts and getting you ready for the next day. Without good sleep your quality of life suffers and the accumulative effects of night after night of sleeping badly will eventually catch up with you. It presents in a number of ways, such as stress, inability to focus and other physical effects, which will impact the ability you have to do your job, be there for your family, and lead a fulfilling life. 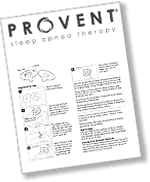 Provent aims to eliminate the stress and strain that snoring and sleep apnoea can put on your life and relationships. To find out more about this revolutionary treatment, please do not hesitate to get in touch. We will be happy to discuss your needs and help you decide if Provent Therapy is right for you. Pick up the phone and call us on 1300 76 72 79 to speak with one of our team. Our staff are experts regarding our entire range and can help you make an informed purchasing decision. You can also leave your details in our contact form and we will get back to you as soon as we can. Provent patches are applied directly to the nostrils, each night before bed. It’s as simple as that. You require no specialist equipment or technique beyond a steady hand. Once applied they will last the night regardless of your sleeping style. They are designed to be sweat and heat resistant, staying firmly in place even during the warmest of summer evenings. The application and instruction guides (PDFs) below will walk you through how to apply the Provent patches correctly and provide you tips to adjust to wearing it. Most people find Provent comfortable and easy to use, getting used to the feeling in just a few applications and not noticing it once they have acclimated. Coupled with the improved sleep, you will forget you have anything on your nose before you know it and will only notice the effects of better, uninterrupted sleep. Please consult with your physician before using Provent for Obstructive Sleep Apnoea. Clinical studies have shown that 83% of patients experienced a snoring reduction with Provent Therapy. Among OSA patients that snore, Provent Therapy virtually eliminated snoring in 58% of patients. These figures speak to the effectiveness of Provent, a system that is the result of many years of research, development and testing. For Provent to work effectively, the patient must breathe through their nose. Should this not be the case, then the use of a chin strap may be sufficient for prevent oral breathing. However, if nasal breathing is prohibited, for example due to a deviated septum, then Provent would not be suitable. How long does it take to adapt to Provent? 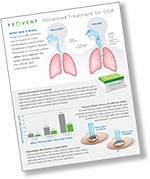 The success rates of Provent are high, with recent clinical studies finding that 81% of OSA patients were successfully treated. Discussions with your consultant will help determine if Provent is right for you. Due to the disposable nature of Provent devices, the upfront cost to start Provent is significantly less than most treatment options. For example, a Provent Starter Kit costs around 15% of a CPAP kit. Yes, In recent clinical studies, no device-related adverse events were reported. However, there are some health conditions which would make Provent unsafe; these include severe heart disease (including heart failure), pathologically low blood pressure, and severe breathing disorders. . Always discuss the suitability of Provent with your sleep physician prior to beginning treatment. Clinical studies have shown that 83% of patients experienced a snoring reduction with Provent Therapy1. Among OSA patients that snore, Provent Therapy virtually eliminated snoring in 58% of patients. Constant Positive Airway Pressure (CPAP) increases the pressure on both inhalation and exhalation., Provent Therapy increases the pressure on exhalation only. CPAP increases pressure in the airway using forced air, while Provent Therapy uses the patient’s own breathing to create pressure during exhalation. Provent Therapy cannot be used together with a CPAP machine, but some users find that it’s more convenient to use Provent when traveling and CPAP when at home. Do I need a prescription for Provent Therapy? No, Provent Therapy is a non-prescription product in Australia. Ask your physician if it’s right for you. What can I expect from my initial experience with Provent Therapy? After you apply the Provent Device, you should notice the resistance created as you try to exhale. Generally, users get used to this feeling after wearing for several nights. Put the devices on just before going to sleep. Breathe out through your mouth. After falling asleep, most people will automatically breathe through their nose. Getting used to wearing a device that affects your breathing may take time (one night to a week or longer). Remove the device if you wake up during the night and feel uncomfortable. This may happen for several nights until you become used to wearing the device. It is normal for the Provent adhesive ovals to overlap between the nostrils. Oil/Moisturizer on the surface may prevent the adhesive from sticking. Wipe around the nose with a clean tissue or cloth and allow to dry before applying Provent. Patients should not use any single Provent Nasal Device for longer than one sleep cycle (e.g., overnight). The device is intended for single use only and should be disposed of after use. Reuse of the Provent Nasal Device will weaken the adhesive, resulting in an inadequate seal and reduced effectiveness of the device. Patients have any sores, abrasions, or skin or mucosal irritation on or around the nose. I have been using this product for nearly two years now and it certainly has made a difference lessening my snoring and sleep apnea. ccidentally purchased two starter kits instead of a two normal month's supply. So I just threw away a weeks worth.